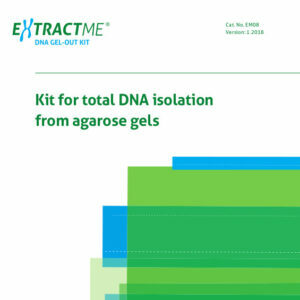 The EXTRACTME DNA GEL-OUT KIT is designed for rapid and efficient purification of DNA fragments directly from agarose gels (standard and low-melting point agarose gels run in either a TAE or TBE buffer). 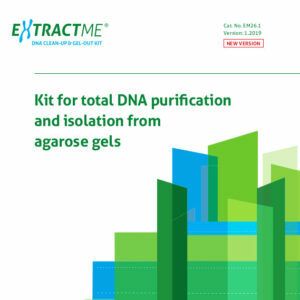 Agarose, ethidium bromide and other contaminants from a sample are effectively removed in the purification process. 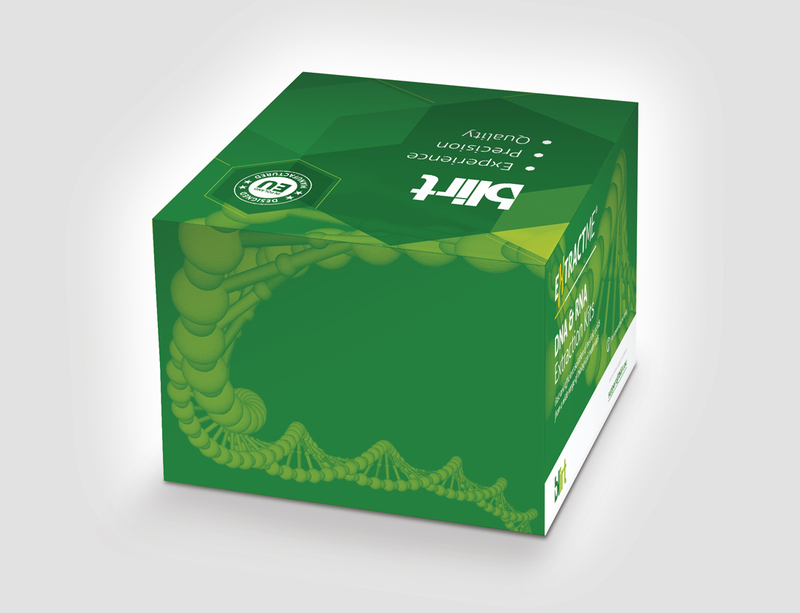 The kit enables the purification of DNA fragments from 50 bp to 20 kb, as well as plasmid and genomic DNA. However, purification of fragments smaller than 100 bp and larger than 10 kb will result in decreased recovery rates. 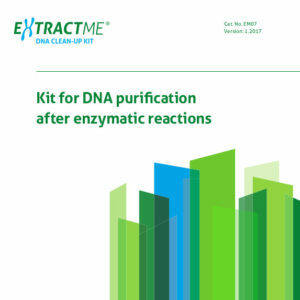 The purified DNA can be used in common downstream applications. The purification protocol and buffer formulations were optimized for high yields and DNA purity. The product is intended for research use only. The DNA purification procedure utilizes spin minicolumns with membranes which efficiently and selectively bind nucleic acids. 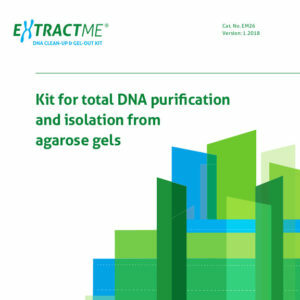 In the first step, the DNA fragment is excised from an agarose gel and incubated in GB Buffer, which enables gel fragment solubilization and protein degradation. As an added convenience, binding buffer contains a colour indicator, which facilitates easy monitoring of the solution’s pH for optimal DNA binding. The two-step washing stage efficiently removes impurities and enzyme inhibitors. 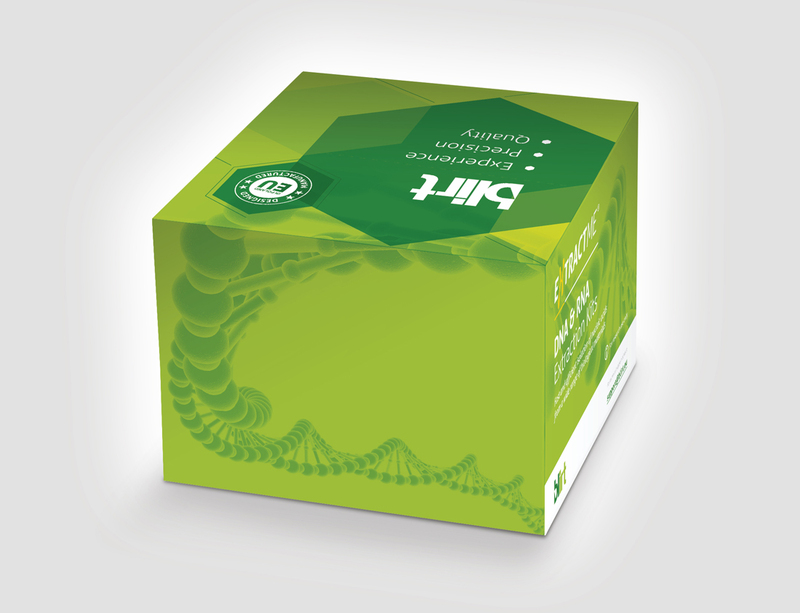 The purified DNA is eluted using either a low ionic strength buffer (Elution Buffer) or water (pH 7.0–9.0) and can be used directly in all downstream applications such as PCR, qPCR, Southern blotting, DNA sequencing, enzymatic restriction, ligation and so forth or stored until ready to use. Genomic and plasmid DNA, however, the efficiency will be decreased. Optimal volume of Elution Buffer used should be chosen in line with the type of DNA in a sample and final DNA concentration expected. The use of 50–100 μl of Elution Buffer is recommended. If a high DNA concentration is desired, elution volume may be reduced to 20 μl. It should be noted that this may reduce efficiency. It is essential to apply Elution Buffer precisely to the centre of the membrane. In order to maximize DNA retrieval, heat Elution Buffer to 70°C and incubate it on the membrane for 10 minutes. If full DNA retrieval is required 200 μl Elution Buffer should be used. However it will result in DNA dilution. Second elution can be also be performed. For second elution, repeat steps 11–14 of the Isolation Protocol (section XI), placing purification column in a new, sterile 1.5 ml Eppendorf tube. Elution Buffer does not contain EDTA, which may interfere with some enzymatic reactions. GB Buffer contains an indicator, which enables pH monitoring. Yellow indicates that the solution’s pH is lower than 7.0 and guarantees an optimal DNA binding with the membrane. When the pH is higher than 7.0, solution turns pink. It usually happens when the pH of DNA sample considerably differs from the standard parameters of DNA treatment operations (pH>9.0). In this case, it is essential to add 10 μl of 3 M sodium acetate (pH 5.2). It will lower the pH, enabling the solution to bind efficiently with the minicolumn membrane. Loading Buffer is provided for analysis of purified DNA samples with the use of gel electrophoresis. Loading Buffer contains 3 dyes (bromophenol blue, xylene cyanol and orange G). Loading Buffer is concentrated by a factor of six, thus, in order to obtain the most satisfying results mix 2 μl of Loading Buffer with 10 μl of purified DNA. Protect GB Buffer from the sunlight. In order to avoid evaporation, ensure that the buffer bottles are tightly closed before storing. The quality of each production batch (LOT) of the EXTRACTME DNA GEL-OUT KIT is tested using standard QC procedures. Purified DNA concentration and quality are evaluated by gel electrophoresis and spectrophotometer. Stec Rafał, Semeniuk-Wojtaś Aleksandra, Charkiewicz Radosław, Bodnar Lubomir, Korniluk Jan, Smoter Marta, Chyczewski Lech, Nikliński Jacek, Szczylik Cezary.